Win Two Tickets to Sound Bites this Sunday! This Sunday night at the 9:30 Club, DC Central Kitchen is hosting a fundraiser to help raise their operating budget for 2010. The organization’s mission is to use food to strengthen bodies, empower minds and build communities, something that everyone here in town can get along with. More than just a shelter, DC Central Kitchen runs a culinary job training program where less fortunate residents can get the job training they need to work in the city’s amazing kitchens. 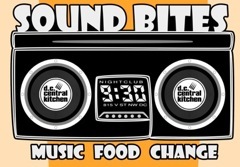 DC Central Kitchen has teamed up with the 9:30 club to showcase some of the city’s best food and its best DJs to combine into a must-go event to help the community. 9:30 club will be open both inside and out, for the first time in its history as part of the event, with food sponsors like BGR, Church Key, CommonWealth Gastropub, Cork, EatBar, Masa 14 and Sâuçá. Tickets are just $30 and include all you can taste, and all you can dance. Will Eastman, Fatback, U.S. Royalty, Bluebrain, Midnight Kids and Beautiful Swimmers will all be performing as part of the benefit, as well. Better yet, we’ve got two pairs of tickets to give away right here on the blog. Tell us what you’re excited to eat, and why you want to help DC Central Kitchen below and you’ll be in the running for one of the pairs of tickets. We’ll close this all up Wednesday at noon and give out the tickets. I’m super-excited about this event supporting DC Central Kitchen; they make amazing food while providing great job training and opportunities to the community. I’d buy a ticket if I could afford to. Hope to be able to try some exciting vegetarian fare and be introduced to great music. Saw DC Central Kitchen on Jose Andre’s 60 Minutes interview — what a great program! Excited to support in such a fun way — mmm Masa 14! As a passionate foodie I believe everyone should have a good meal and I love how DC central kitchen delivers on that! I am excited to eat more of that amazing green sauce they serve at Commonwealth! DC Central Kitchen has provided residents in need with the right tools to both those in need and those who can lead. As a DC resident, I am proud to support such a wonderful organization. This event is an excellent opportunity to sample some of the best food in this city and I hope to join in on the feast! Love me some Taylors and Midnight Kids. i support dc central kitchen because the amount of surplus food that goes to waste every day in this country is simply insane, and they do their part to actually put it to good use. who could argue with that? it’s a great cause. Central Kitchen is such a remarkable organization. Not only do they provide healthy, delicious meals to those in need, but they provide what I think is the most valuable service they could – helping those who are less fortunate get back on their feet by teaching them skills that will help them land steady jobs. They in turn help to prepare food for those homeless men and women who need a hot meal. This is the kind of cycle we need more of in DC – people helping each other out. Plus they use extra food that would otherwise go to waste. Their website says they hate to see wasted potential and I can see that philosophy working in their food as well as their drive to teach marketable skills to those who need it most. I’d love to be able to support something so unique and helpful to our community. Plus I’ve been trying to get to Church Key forever but it’s always packed! Thanks to WeLoveDC for drawing attention to a worthy cause. All of the food sponsors sound delicious (although i’ll be most excited for churchkey mac and cheese sticks and cork anything)! Having volunteered for DC Central Kitchen in the past, i am eager to support their amazing efforts. they are incredibly organized and do fantastic work- the full up volunteer slots are a testament! I am actually most excited about trying the food from Fresh Start Catering! I love that graduates of Central Kitchen’s training program get to work for an organization that gives back to program. I hear about DC Central Kitchen from a Social Media Conference in Virginia last fall and fell in love with their food. From then on, the organization and CEO, Robert Egger, became well known on Twitter. I think its a great organization and I’m interested in learning more.